Adora’s Zig Zag Twin Jogger Stroller adds more love, more joy and more hours of playtime fun! Beautifully crafted, this Zig Zag Twin Jogger Stroller can fit TWO dolls, stuffed animals and/or plush dolls up to 16” in length. It features an attractive gender-neutral zig zag design in cool mint, white and gray, and even has a storage compartment and convertible shade. 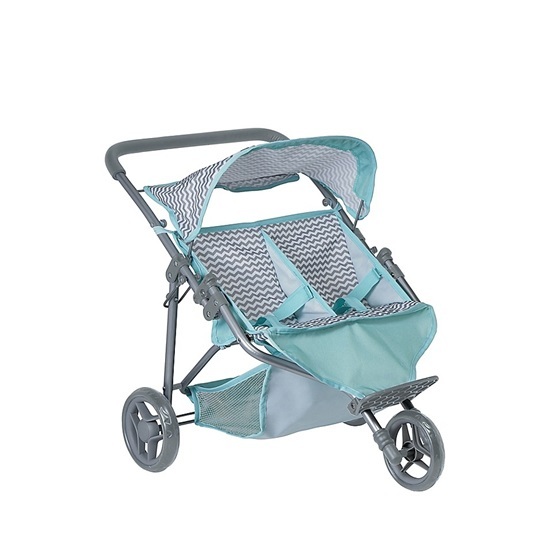 Easy to assemble and made with high quality materials, this lightweight stroller makes it easy to tote around all your little one’s favorite Adora dolls and toys. It even folds up for easy storage! Perfect for little parents that are always on-the-go, Adora’s Zig Zag Twin Jogger Stroller is a must-have accessory! Ages 3 and up.